Processed using a non-chemical method. Made from hulled sesame seeds. methionine. Also, healthy fatty acids of omega 3 & 6. High level of calcium & protein. 2. 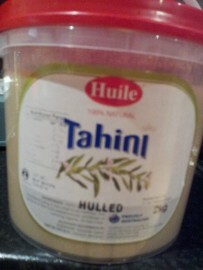 Add with hummus, baba ghanoush or halva. 3. Use on meat and vegetables. 4. Refrigerate after opening for prolonged life.